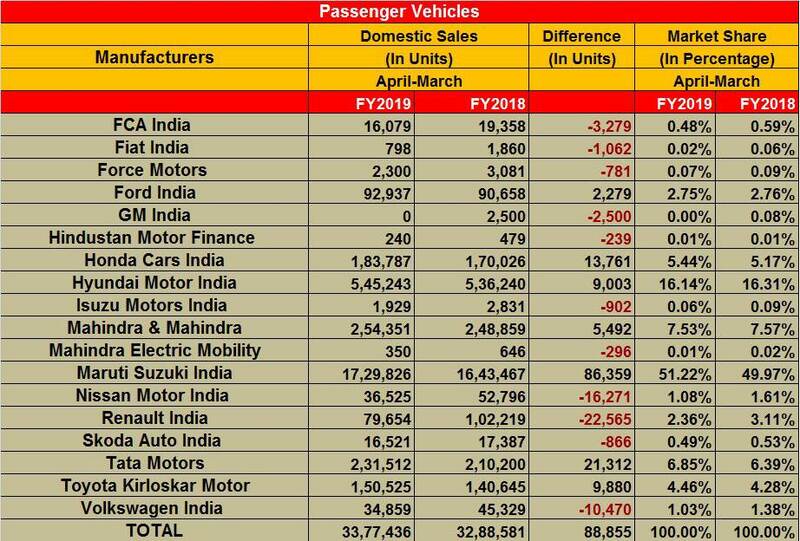 Just as India Auto Inc cannot rejoice over the performance the industry witnessed in FY2019, there is still some cheer for country’s leading carmaker, Maruti Suzuki India, which saw its share of the passenger vehicle (PV) segment rising amidst an atmosphere of slowdown. PVs, which clocked 3,377,436 units in FY2019, dwindled in their results as they registered significantly underwhelming performance which even 'beat' SIAM’s growth outlook at the start of the fiscal. Against a projection of 10-12 percent growth, the industry saw PVs culminating at a mere 2.70 percent towards the end of FY2019, over the 3,288,581 units sold in FY2018. Rising fuel prices through the major portion of the fiscal, amplified by poor consumer sentiment around the festive season caused by a liquidity crunch in the market, all but brought the PV segment down to its wheels. While the scenario impacted many OEMs, Maruti Suzuki India kept trudging along with overall sales of 1,729,826 units by the end of the fiscal, leading it to grow its overall PV market share to 51.22 percent, which stood at 49.97 percent until the end of FY2018 with cumulative sales pegged at 1,643,467 units. What helped in this endeavour was the performance from the company’s UVs, especially the facelifted Vitara Brezza and the next-generation Ertiga. Its entire range which comprises a total of five UVs, registered a 4 percent growth in sales with volumes of 264,197 units (FY2018: 253,759). Moreover, the company saw growth in sales of its compact models which include the Swift, Ignis, Dzire, Baleno, Celerio and now also the New Wagon R. The sextet recorded an over 15 percent surge with combined volumes closing in at 861,804 units, over the 748,475 sold in FY2018. The New Wagon R now sees the car growing bigger and getting a larger 1.2-litre displacement along with the 1.0-litre three-cylinder motor which was the sole engine choice available in the outgoing model. Maruti also brought the Baleno facelift in January this year, and the car is ranking good numbers as has been the case from our Top 10 PVs list for February. The company is now in the process of upgrading its products with safety features, for instance the just updated Alto K10, as is mandated in the regulations. Unlike Maruti, the country’s second-largest carmaker by sales volumes, Hyundai Motor India could only maintain its PV market share, even though it observed a slight increment in its total sales which closed at 545,243 units in FY2019, as against 536,240 units in the previous fiscal. Hyundai maintains its hold over a 16.14 percent market. The Grand i10, Elite i20, Xcent and the newest Hyundai Santro, which was launched in October 2018, have all aided the company’s growth drive. The four cars recorded a respectable growth of 7.15 percent with sales totalling 352,144 units, where they were placed at 328,634 units in FY2018. Tata Motors was one of the biggest beneficiaries again where the company saw its PV market share grow from 6.39 percent in FY2018 (FY2018: 210,200) to 6.85 percent in FY2019 with overall volumes clocking 231,512 units. Again the major role played was by its Nexon crossover, but also by its hit--with-the-masses Tiago hatchback, which surpassed the 200,000 sales milestone in February this year, in a short timeframe of less than 35 months since launch in April 2016. Come October 2018, Tata also launched the performance oriented Tiago and Tigor JTP twins to entice enthusiast buyers. The company will now introduce its Tata Altroz hatchback to mark its entry into the premium hatchback space and compete against segment stalwarts of the likes of the Maruti Baleno and the Hyundai Elite i20. Honda Cars India too observed an expansion in its overall PV market share, coming on the back of the second-generation Amaze, which was launched in May 2018. The car has boosted sales for Honda in the gone fiscal, where it registered overall volumes of 183,787 units coming over the 170,026 units sold in FY2018, leading to an increase in market share from 5.17 to 544 percent. Owing to strong demand of the Amaze, the company saw a sharp rise in combined sales of the Brio, Jazz and the Amaze, which stands at 101,353 units, almost doubling over what it sold in FY2018 with 53,918 units. Toyota Kirloskar Motor and Mahindra registered an uptick in their overall volumes, the two were able to sustain their respective shares of the PV market. Where the Japanese giant sold a total of 150,525 units (FY2018: 140,645), it maintained its market share at 4.46 percent which increased slightly over the 4.28 percent it had until the end of FY2018. Mahindra & Mahindra, on the other hand, saw total PV sales of 254,701 units in the fiscal (FY2018: 249,505), and remained consistent in its market share of 7.53 percent (FY2018: 7.57%) even as it went on to launch a couple of new models in the fiscal. While the TUV 300 Plus hasn’t shaken the market, Mahindra’s XUV 300, launched in February this year looks promising and the air around the Ssangyong Tivoli-based crossover will only clear in the coming months. Whatever be the case, the Indian PV market still offers a huge opportunity for carmakers to offer products and entice buyers of each category and price point, given the country is still has huge scope of mobilising its masses, where the current vehicle density only stands at a mere 20 cars per thousand people. Going by a relatively slower FY2019, the apex body SIAM has projected a very conservative outlook of 2-5 percent growth for FY2020. Can the industry better that? We will keep track. So stay tuned to Autocar Professional.